In the Stonewall Street Festival and Parade, there was something new. There was a sense of history for a change. Sure, it's a party. But the idea was to show where we all were and where we were going. For once it was not strictly an excuse to act crazy and insane but a chance to reflect. There were the receptions complete with the history timeline, the AIDS Quilt, and other items. 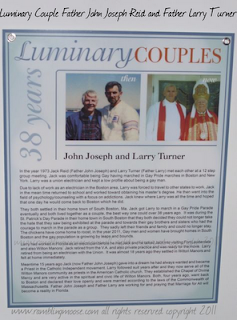 Of the items there were these posters of "Luminary Couples". The call went out to get some gay or lesbian couples who have been together more than 20 years. Consider that time frame. It goes back into the time period where people were hunted down because of who they dared to call their most important person. Back to a time of persecution. Some couples went back before that, there was a couple who had 48 years together. 48 years ago was a world away, and thankfully for the many minority communities, that life is long gone in most of the country. It still hangs on in the minds of some repressive individuals and some backwards areas in the nation. Everyone knows of some backwoods areas that "you wouldn't want to live in" because of the unaccepting mindsets. In the big cities there are corporations that you don't want to work in because they have not learned that to embrace diversity means that you will attract the best and brightest. To embrace diversity means to accept everyone's strengths and work to help everyone past their weaknesses. It is a competitive advantage both in business and when you go home. Look at the top 100 best business lists and you will see a strong statement accepting the diversity in their hiring and in their Mission Statement. Look at the lists of cities that are the best to live in and you find a vibrant community filled with people bringing their best and brightest to the game and feeling that they are welcomed there, not shunned because of their differences. 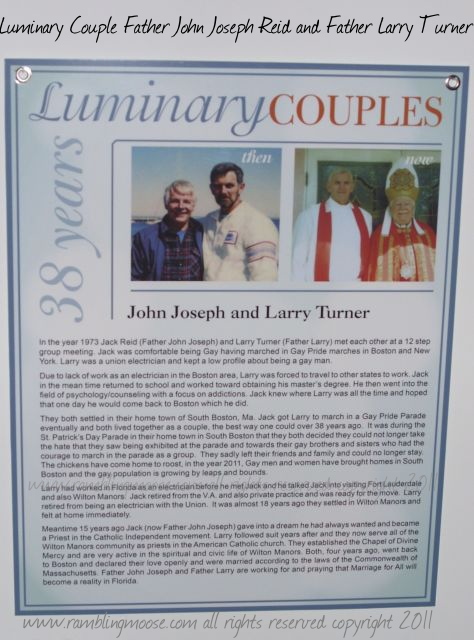 The one Luminary Couple I am honored to know the best is that of Fathers Larry Turner and Father John Joseph Reid. 38 years together. They have lived through intolerance in South Boston to settle here and take up God's Work in the Recovery Community and to help with the homeless while also tending to the spiritual needs of those who are fortunate to find them in their small chapel in Wilton Manors. You can find out more about their church on their website, that of New Divine Mercy. I have been fortunate enough to work with Father John and Father Larry on their website and to help them out with their technology needs as their Project Manager as needs arise. 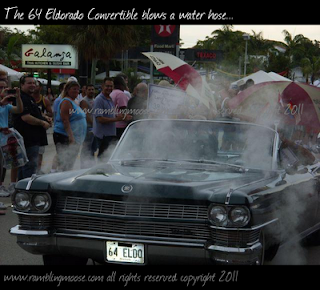 They also have a video channel on YouTube so they can reach further than just here in South Florida. They are a fascinating couple, and if you are looking for an amazing experience, surf their web page, find the information and go pay a visit to their church for Mass. 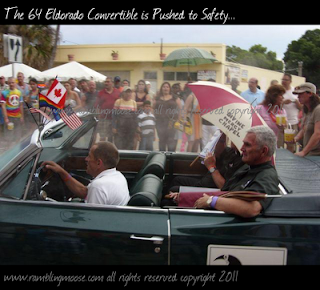 They are truly doing God's Work as well as being good friends to me and the rest of us here in South Florida. John and Larry were chosen to ride along in the Parade, so I made certain to have my trusty and very creaky camera at the ready. 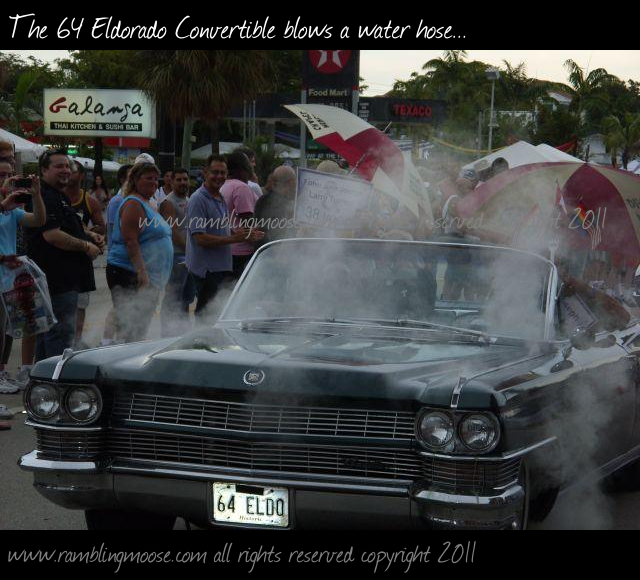 It was at this point where the crowd got together and pushed the 45 year old car down to the next entryway and to safety. Anyone reading this who knows Father John and Larry, knows they're pretty unflappable. You see, John and Larry got out of the car and walked the entire parade route. They were the Luminaries on Foot. I didnt understand it at first but God wanted us to be out amongst the people where they could see us and as we walked along, people along the route were very responsive with applause and thanks. We were the only priests walking the length of the parade route and we did it to show that there are Catholic priests who profess that God loves everyone and that we are there for both Gay and Straight. It was an awesome moment for Father Larry and myself. It had to take God to get that caddilac to start smoking to get us out where we belong, out on the street with his people. And the bottom line is its not about us, its about Him.